If you type Winnemucca, NV, into Google, one of the first search results is from Trip Advisor. It boldly states, Two Things to Do in Winnemucca! Well, with up to two entire things to do, it seems crazy not to make it the place to spend the night. Like many midsize towns, it has plenty of restaurants and lodging, which is all we are really looking for tonight. However, what sets it apart is the legend of a visit by Butch Cassidy and the Hole in the Wall gang. As the story goes, they rode into town and robbed First National Bank Manager George Nixon on September 19, 1900 at knifepoint. Butch and the boys stole away with around $2,000. There is a famous photo of Butch and the whole gang where they are dressed smartly in new suits and bowler hats. The legend says they later sent this photo to Mr. Nixon as a “thank you” following the robbery. Caption: Butch seated on the right, Sundance on the left. 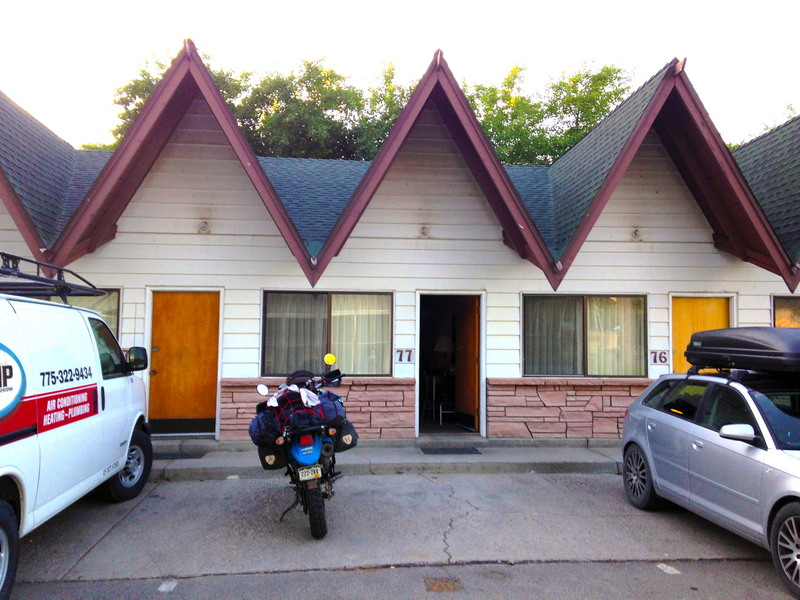 We choose the very retro Scott Shady Court Motel to bunk for the night. It’s off the beaten path and as such is away from the mini-Vegas vibe of the town’s main street. The only drawback would be the “mystery smell,” which can’t be our riding gear . . . or could it? And then there’s the fact that the motel is so old that there are no three-pronged outlets in the room. Ah, first world problems! The whole town feels like the Rat Pack may have made a movie here back in the day, but from what we can tell, the only connection to the movies comes from Joe Robinett who has recreated the front of his home to look like the famous Psycho house! Shockingly, the house is not one of the two attractions listed by Trip Advisor in Winnemucca. So perhaps there is more to this town than meets the eye! I take note that our motel’s sign would not be out of place in an Alfred Hitchcock movie, but that just adds to the charm. Winnemucca is a town big enough to get things done, including shipping continuously unused supplies home, fueling up, and eating. For dinner, we choose Las Margaritas. Good food, but way too much. Even splitting a meal designed for two is more like a meal for four! After dinner we return to the motel. It doesn’t take much to discern that two guys, traveling for days on motorcycles, eating Mexican food, and carrying limited additional clothing could be the source of the mystery smells. But these are questions better left to professionals versed in osmology!